It is time to reimagine and rebuild Singapore, said Prime Minister Lee Hsien Loong, calling for a visionary plan that takes the country from SG50 to SG100 and beyond. In a speech to university students and faculty yesterday, he acknowledged wryly that they may find the comment odd. "Nearly every inch of our land is developed or planned for, and there does not seem to be... empty space for development. So, how can we reimagine and rebuild further?" "The answer is by freeing up new parcels of land, and enabling already developed parts of Singapore to be redeveloped... modernised and improved. With imagination and determination, we can do it." This is being done, for instance, through the movement of Paya Lebar Airbase to Changi. 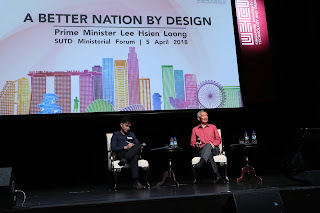 In building for the future, Singapore should take advantage of the experience and resources accumulated, the imagination and skills of its people, and the vibrancy of the region, he said, speaking at the inaugural Ministerial Forum of the Singapore University of Technology and Design (SUTD) in Changi. The aim is to create a good living environment, "a new city built on a human scale with distinctive local identities", he said. This goes beyond well-designed buildings and infrastructure to urban design which is user-friendly and well-integrated into neighbourhoods. Good design involves not just the hardware aspects or the application of technology, but needs a deep understanding of the softer aspects of how individuals behave and how society works, he added. Singapore should also capitalise on the work of past generations, preserving important parts of history while adding on new ideas, so that Singapore can become a multi-layered city like the great cities of the world - "always changing, always fresh", he said. One important piece of the reinvention of the city is the public transport system, he said. It is on the surface an engineering problem, where the network has to have the right connections and coverage, sufficient capacity and flexibility, and be easily maintained so that trains run safely and reliably. On another level, it is an economic problem, with incentives needed for different players - operators, asset owners, the Government and commuters - to help the whole system work well. Train and bus ownership and maintenance, and payments and fares, need to be evaluated. Finally, public transport is a socio-political problem because millions of Singaporeans use it every day, and it is part of the shared experience of living in Singapore and being Singaporean. "None of us likes it when fares go up. So, how do we give the public the assurance that the system is fair, that it is well run, and that... the increases are necessary and justified?" he said. "We have to evaluate the trade-offs carefully and holistically, to decide what will work best, on the whole, for Singapore." 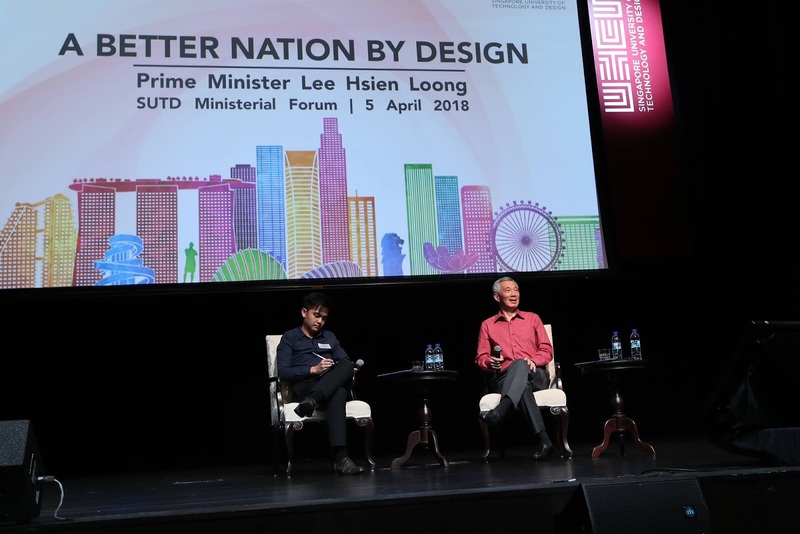 This way of looking at issues through design thinking has been a part of the nation's history, and many other policies benefit from good design, said PM Lee. "Singapore is a nation by design. Nothing we have today is natural, or happened by itself... not our economic growth, not our international standing, not our multi-racial harmony, not even our nationhood." He added: "We didn't call it design thinking then, but... our founding fathers had to understand the issues, define the problem, come up with creative ideas and solutions, prototype the idea... and constantly review the thinking and the solutions." Addressing the SUTD students present, PM Lee urged them to apply design thinking in whatever field they choose to work in. "It will be your turn to paint the canvas, to sketch out the next blueprint and masterplan, to create a new road map and skyline. "I hope that among your generation, you will together master the range of skills and disciplines to design, build and run tomorrow's Singapore," he said. It is neither wise nor workable for the People's Action Party (PAP) Government to "purposely" let the opposition grow bigger when most of the population supports the PAP, Prime Minister Lee Hsien Loong said yesterday. He likened designing a political system to make life easier for opposition parties to creating a safety net for a performer. "The more you have a safety net for the performer, the more dangerous the stunts the performer will do. Because there is no risk, so you will push further." Mr Lee made the point at a dialogue when asked whether Singapore needed to relook its political system and consider proportional representation, a system in which parties gain seats in proportion to the number of votes cast for them. The system has its pros and cons, he said, while stressing the current multi-party democratic system here was not specially designed to have one dominant party. It came about over time, he told students and faculty at the dialogue, at which he was also asked about Singapore's progress to being a Smart Nation. "It started out with very rambunctious parties... and it became like this through a series of accidents of history, as well as the effort by the PAP in the early years to stretch out and become a national movement,'' he said. As for deliberately cutting back so that "somebody else can grow bigger", he said it is hard enough to build a strong team of leaders in a small country like Singapore. It would be shortchanged if he were to ask three ministers, for example, to switch sides just to boost the opposition, he added. Citing the Non-Constituency MP scheme, which will ensure at least 12 opposition MPs after the next election, he said that with the right 12 people, "they will be able to hold the Government to account... and then in the next election, they will win more". He noted that in 1955, the PAP won just three of the 25 elected seats in the Legislative Assembly. One of the three elected was Mr Lee Kuan Yew. "I think the colonial government was fully held to account. Today, they don't have such a person in the opposition." On being a Smart Nation, PM Lee said that while Singapore should use information to improve people's lives, it must not be done in a way which is overbearing, intrusive or unethical. For example, an artificial intelligence program should be able to identify clusters of a disease by combing through medical certificates and doctors' reports without breaching patient confidentiality, he said. "We know what we want to do. How to do it in a way which people find okay and is in fact safe, (for) that we have to feel our way forward."